This retro picture shows Couch Side baseball insider Brandon Smith interviewing former NAU swimmer Kimber Morelli. Smith joined Couch Side host Wade McMillin as the guest host of this week’s podcast. If you would have asked us this past summer who we thought would win the NBA Championship, I’m sure we would have had three answers for you: the Miami Heat, the Oklahoma City Thunder, or the most likely scenario, no champion at all. With the lockout breathing down the NBA’s neck, it was hard to have realistic expectations for a 2011-12 NBA season. Though the shortened schedule has led to its share of surprises (I’m looking at you, Utah Jazz), the older mainstays have managed to stay true to form and the young, upcoming teams have seemingly dominated a shorter, more physically daunting schedule (with the exception of the San Antonio Spurs; how does Popovich do it?). Now that the regular season is over and the match-ups are set, it’s prediction time, and who better to run down the NBA playoffs than two diehard fans? We will admit our last article was a WWE-themed article, so it’s time to pop our cherry once and for all and tackle a real sport. Matt: I was a little disheartened to see the Jazz easily dismantle the Phoenix Suns this past Tuesday, breaking the hearts of Phoenix fans while ensuring Utah’s trip to the postseason. Now that it’s all said and done though, I have a hard time picking either of the two against the Spurs. Though San Antonio showed last year that one-seeds aren’t unbeatable, I don’t see them losing two years in a row in first-round upsets. Plus, Utah’s front court players (Derrick Favors, Al Jefferson, and Paul Millsap) aren’t nearly as intimidating as Memphis’ combination of Zach Randolph and Marc Gasol a year ago. Expect a pretty lopsided series in my eyes where the veterans show the young studs a thing or two about postseason basketball. Brett: I spent last Tuesday night at Matt’s house, watching the Suns/Jazz battle it out for a playoff spot while simultaneously writing our Extreme Rules predictions. When the triple zeroes hit and the Suns had lost and missed out on a chance for the final berth, I was left not heartbroken nor happy, but relieved. Because I knew that I would not have to watch the Suns endure a humiliating first round exit to the Spurs, which is what the Jazz will encounter. San Antonio is a deep team, starting with their Big 3 of Tony Parker, Manu Ginobili (bleh) and Tim Duncan, the greatest power forward ever. Their bench is young and talented and the late-season acquisitions of Stephen Jackson, Patty Mills and Boris Diaw were solid. The Jazz are young but inexperienced in the playoffs and will have trouble containing the Spurs on both ends of the floor. This one should be a cakewalk for San Antonio. With March Madness, NFL free agency and baseball’s Spring Training in full swing at the beginning of March, sports fans may forget about the NBA Trade Deadline on March 15. It may be a snoozer of a deadline as the playoffs begin just six short week later and as some general manger begin to question whether this is the right year to wheel and deal. The NBA lockout put a hinder on a lot of things and this year’s trade deadline may feel the negative effects the most. So NBA fans, don’t be holding your breath that your team is going to make that one move to put them over the top next week. It likely won’t happen. Be that as it may, deal will be done. They probably just won’t have that blockbuster title with them. Are NBA “superstars” ruining the game? NBA stars are becoming bigger than the game itself. And it’s making fans bitter; quickly turning them into haters. Stars have always enjoyed special treatment. But when the power shift is so one sided that players like Dwight Howard can demand a trade the year before his contract expires, general managers are put in quite a predicament. Do they chance losing their star at the end of the season and have nothing to show for it or trade the core of the team that they’ve spent the past several years and millions of dollars building? And fans resent this. Not just fans of these teams, but fans of the game in general. I’m a huge Denver Nuggets fan. I’m also a huge Syracuse Orangemen fan (yes, they are still the Orangemen to me, although the change to the Orange is growing on me). 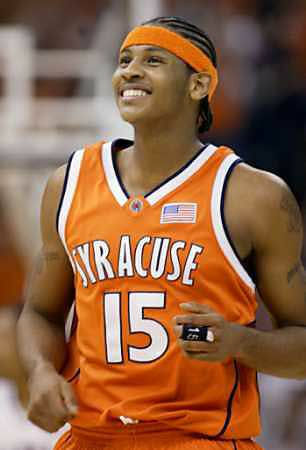 So When the Nuggets drafted Carmelo Anthony in 2003 it was a dream come true. He took Denver, a perennial lottery team, to the playoffs in his first season. But after what happened with Melo last season, I’m a hater now. I hate the Knicks, Amar’e Stoudemire (for no good reason) and Spike Lee (seriously, does anyone actually like that guy). I even hate the Lakers, and as I write this blog I’m watching the Knicks take on the Lakers. I’m rooting against the Knicks, but essentially that means I’m rooting for the Lakers! talent, but none of them will ever fill the shoes of Anthony.